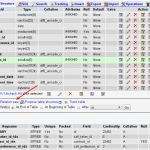 It is possible to export the contents of a table directly to csv format from within mysql. It is useful when migrating large tables. CSV export import is much faster for large tables compared to mysqldump/mysql command. Make sure that the path to the output file is writable by mysql. Hence first delete any older version of the file if it exists. Rest is pretty much same.